Like New Year 2018 is knocking your doors to celebrate with it & willingly you are also welcoming it by changing the wall calendar, exactly same it will be done by Google on this occasion. 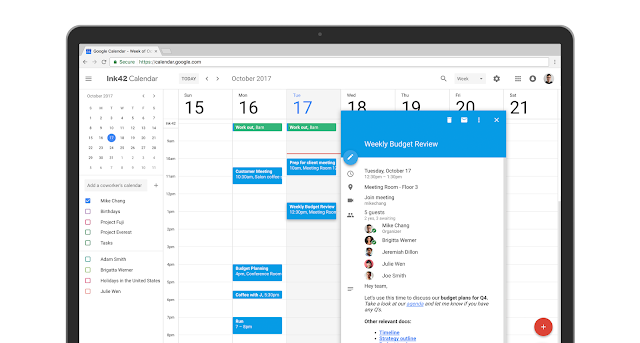 Soon, the design of your Google Calendar will be changed and you have to forcefully opt what Google wants! Hey, Nothing to worry guys! You will like the new look of this calendar. Here, you can apply rich formatting to your Calendar invites; handle multiple calendars side by side and many more. Before going on date issues, let’s check features of Google Calendar in detail. See conference room details when booking a room: Here, G Suite admins can now enter detailed information about their organization’s meeting rooms. So that, their employees can easily get to know where a conference room is located, how large it is, and whether it has audio/video equipment or is wheelchair accessible. Add rich formatting and hyperlinks to your Calendar invites: Through this feature, you can link to relevant spreadsheets, documents or presentations in your Calendar invite and open them directly from the new Event Detail view. This can help you create more detailed agendas and ensure all materials are in one place before your meeting starts. Manage multiple calendars side by side in Day view: In it, you can now view and manage calendars in separate columns. Click Day view and select the calendars you want to compare. Simple! See contact information of meeting participants when you hover over their names in a Calendar invite. A new way to view and restore deleted items in one place in case you accidentally delete a meeting invite. Additionally, Day, Week and Month views are now more accessible, featuring better compatibility with screen readers. Jan 8: If you chose Rapid Release schedule, your calendar will be auto-upgraded starting from 8th January 2018. Jan 15: If you are opt in for the Scheduled Release plan then your calendar will be upgraded from 15th January. Feb 28: D-day for everyone. Willingly or unwillingly, you will have to opt new design of Google Calendar. No choice!